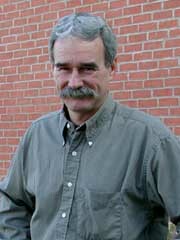 Jim Graham conducts a wide range of research in the pathological and microbiological relationships of citrus and citrus soils. Asiatic citrus canker is an exotic and damaging fruit and foliage bacterial spot that has threatened to spread from metro Miami into several areas of Florida’s citrus industry since the mid 1990s. In collaboration with the Florida Citrus Canker Eradication Program and U.S. Department of Agriculture, Agricultural Research Service Graham participated in a joint study that demonstrated the bacterium is readily spread by subtropical rainstorms and that the majority of new canker infections after storms occur within about 1,900 feet of source trees in the urban environment. This research served as the basis for the state’s “1,900-foot rule” requiring all trees within that radius of an infected tree to be destroyed. Graham and Jaime Cubero, his post-doctoral associate, have designed and applied new molecular probes capable of detecting and identifying the bacterial strains from each canker outbreak to make inferences about their origin and spread in Florida. These molecular tests are utilized routinely for the diagnosis of citrus canker by Florida’s Division of Plant Industry. Another aspect of Graham’s research addresses interaction between soil-borne pathogens and root pests of citrus. A root weevil called Diaprepes abbreviatus has caused devastating tree losses in more than 50,000 acres of citrus and is spreading rapidly. Graham discovered that the citrus root pathogen, Phytophthora, forms a complex with insect larval feeding, and moreover, that a newly discovered species, P. palmivora, severely damages roots, causing rapid tree loss. According to Graham’s studies, the traditional sources of citrus rootstock resistance are highly susceptible to P. palmivora. Graham’s discoveries have served to redirect the efforts of rootstock development programs at UF and the USDA.